Yup. Another post that has to be done!! 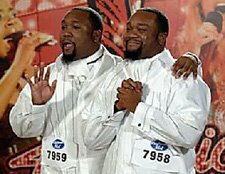 Tired of seeing the mess of the Brittenum twins on American Idol. Enough already!! Bitter party of two. And if the Brittenum twins really know all of these agents that they refer other contestants, why do they need to be on American Idol anway. Please reference wise mothers in the Miller posting. We are tired of seeing the American Idol promo "My spirit has been broken" and thankfully have less than 24 hours to hear it for the last time. Seacrest In....Brittenum twins out!! You have busted Hollywood. It was 15 minutes of fame and 14 1/2 of those minutes was OVERKILL! !Good riddens!! The twins are still here? What the hell is going on?!? !